By car: from motorway A4 (MI-VE) take the Valdastico exit (A-31 VICENZA NORD). After exiting, follow the direction for Vicenza, then turn right for Monticello Conte Otto. Once you arrive in Monticello Conte Otto, turn left for Cavazzale at the town hall. We are located in Via Revoloni, 2. 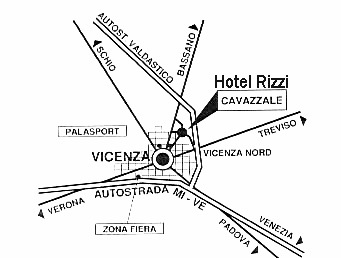 The Rizzi Hotel is located 4 kms from downtown Vicenza. From downtown Vicenza, take the Marostica motorway towards Bassano. After 4 kms turn right at the first traffic light in the direction of Cavazzale. Our hotel is located in the center of Cavazzale. By train: from the Vicenza train station take the local train for Schio and get off at the first stop which is Cavazzale, 7 kms from Vicenza. The hotel is 200 meters from the Cavazzale train station. By bus: take the no. 11 bus from Matteotti Square (Olympic Theatre) and you arrive in Cavazzale in 10 minutes. The bus stop on Via Roi is 100 meters from the hotel.